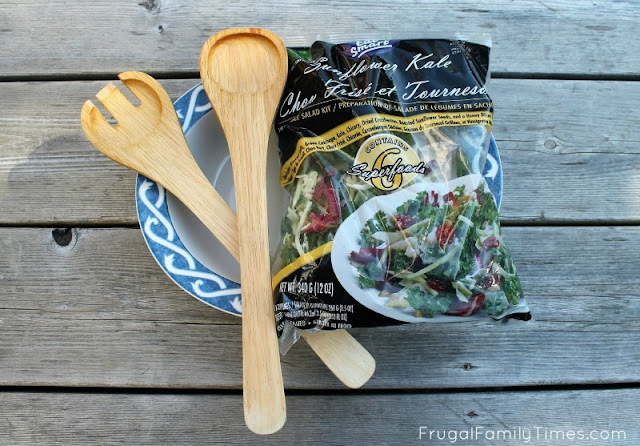 Do you use packaged salad kits? Do you ever feel a tiny bit guilty about it? As a Registered Dietitian and Frugal Blogger, I'm here to tell you: cut that thinking out! Did you shoplift the salad? Then you should feel very guilty. But if you're making this choice because you are a busy parent who also wants to eat healthfully - don't waste your time on guilt. There are times convenience foods can be incredibly helpful. We love salads. We try to have them as an option with every dinner meal. The health benefits are obviously a big plus: Fiber! Vitamins! Phytochemicals! But beyond that - a good salad tastes great and the texture and freshness makes the rest of the meal taste better too. What's not to love? Well, to be honest, we don't love the work that goes into making these salads. After a busy day at work and prepping the main course feels like plenty to do. The idea of washing, drying, peeling and chopping the ingredients for a side dish is less than inspiring. That's why prepared salads often have been our go-to quick, fresh side. The good folks at Eat Smart sent us a few of their new flavours of Gourmet Premium Kits and single-serve Shake-Ups to taste and talk about. We're happy to have the opportunity to tell you all the ways packaged salads can make a smart money choice! This is often true for many. The will is there - we know how important dark green leafy vegetables are for our diet. But, our attempts at washing, trimming and preparing our own leaves fall short. How many times have you taken a bag of damp, blackish leaves from the crisper and put them directly into the compost? We've done it an embarrassing number of times. Grocery-shopping-Robin wrote a cheque that supper-making-Robin couldn't cash. What a waste! Prepared salads, like Eat Smart, mean that any meal can feature a true gourmet side salad, ready when you are. While often more expensive than scratch, it can often come down to prepared salads or no salad at all. Putting a bit more of the grocery budget towards healthy greens is a good choice, especially if you wouldn't otherwise eat them. Have you ever tried to prepare a salad from scratch while camping? Even if you're a fan of chopping and prepping veggies at home, doing the same on a picnic table with limited cooler space to store all the fresh veggies and dressing usually makes camping a carnivore's paradise. Enter prepared, bagged salads - space saving, lots of variety and perfect for a weekend in the woods. We enjoyed this Strawberry Harvest salad at our "cottage". Such a great side dish when the main course is simple hamburgers. Road trips are another area where fast food, granola bars and other preserved foods dominate our diets. Eat Smart single serving Salad Shake Ups to the rescue: Great salad variety, premium toppings and dressings, and no artificial preservatives, colours or flavours. And a fork! So easy to eat in the car or hotel room. Cheaper than take-out, easier than homemade and better for you. Win. Win. Our daughter prepped the Sunflower Kale kit herself. She then proceeded to willingly try some new foods we're thrilled with: kale! red cabbage! honey dijon dressing! 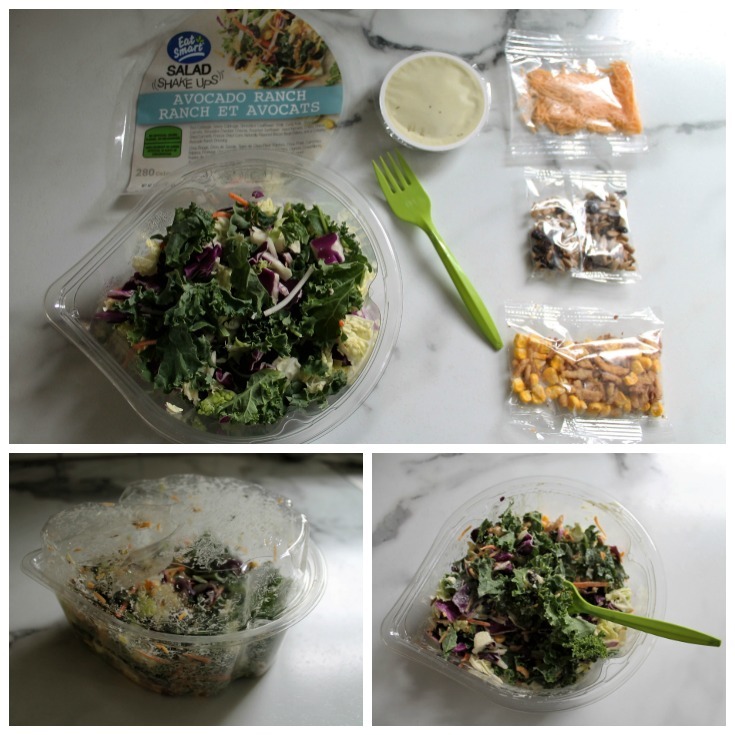 We let our daughter (who likes Cesar salads, but almost nothing else green and leafy) pick one of the Eat Smart Gourmet Salad kits we were provided to review. She not only got excited about the choice but loved making the kit and was so into it that she tried a big helping and LOVED IT. Making food themselves is often a great gateway to getting them to try and enjoy new tastes and textures. And a no-fail "recipe" like a salad kit sets them up for success! An easy lunch with everything you need! 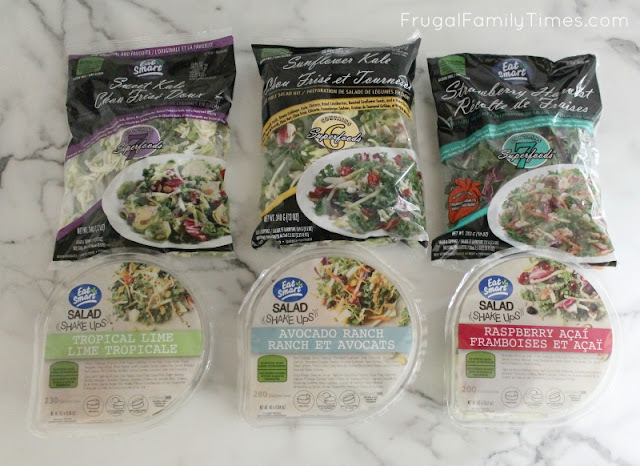 Avocado Ranch Salad Shake-up is a fresh delicious meal on the go. Being our frugal selves - we always pack lunches and bring them to save. Well, except the days where one of us heads to work with a carefully packed lunch sitting forgotten on the counter. Sigh. A quick stop at the grocery store and something like the Salad Shake Ups are there for your forgetful (or too tired to make a lunch or no leftovers in the fridge) days. Totally healthy, totally self-contained and affordable compared to another fast food meal. In our in-store Grocery Strategy post, we talked about hunting for discount stickers. 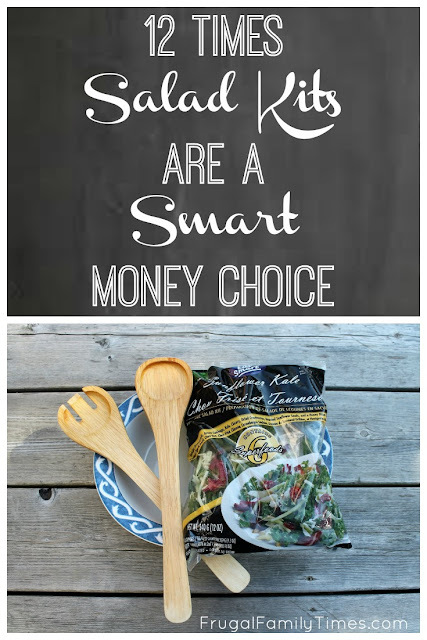 Salad kits are a great find - in fact that's how we first discovered Eat Smart salads! Perishables are one of the most common things you can get great bargains on and they usually have a decent amount of shelf life remaining. If the idea of prepared salads make you balk a bit at paying more, watch for the discounts - they can be found fairly regularly - just keep in mind the freshness may not be perfect. We scincerely enjoyed all six flavours - not a dud in the bunch. As I write this I'm suffering from a back injury. I can't stand straight, let alone stand at the counter and clean and chop - it's so darn painful! No one feels like cooking when they are unwell. Frozen meals have saved a few nights at our house when one or both of us was under the weather. However, they often lack that healthy, fresh kick that a well-balanced meal should have (especially when you're trying to get well). Pair that same prepared meal with a Gourmet salad kit and your dinner plate gets prettier and healthier. All of the Eat Smart's kits are pre-washed and ready to go, so they are perfect for no-work meal nights. 8. If you have a coupon! If you don't like shopping the discount stickers, watch for sales (you'll find them) and coupons (you'll also find them). You can get a coupon today! Pop on over the Eat Smart's website, sign-up for their e-newsletter and get Exclusive Offers sent directly to your inbox. - thanks to this creative kit - we will do this again! We try to eat local - but Canadian winters mean that would be a whole lot of root vegetables and very little else. Eat Smart Salad kits are a great way to get a variety of greens during the time that snow covers our raised garden beds. Even better - by next year, Eat Smart will be the only company to offer salads with no artificial colours, preservatives, flavours, hydrogenated fats or sweeteners (like high fructose corn syrup). Check the labels - you'll see that you can recognize all those tasty ingredients and that is a good thing. You've heard of all the cool ingredients out there. Superfoods! Kale! Quinoa! Acai! Stuff that sounds worth trying but feels intimidating to find a recipe, shop for, prepare and then maybe find out you don't like. Salad kits have given us the confidence to jump in and embrace new flavours and we're better for it. 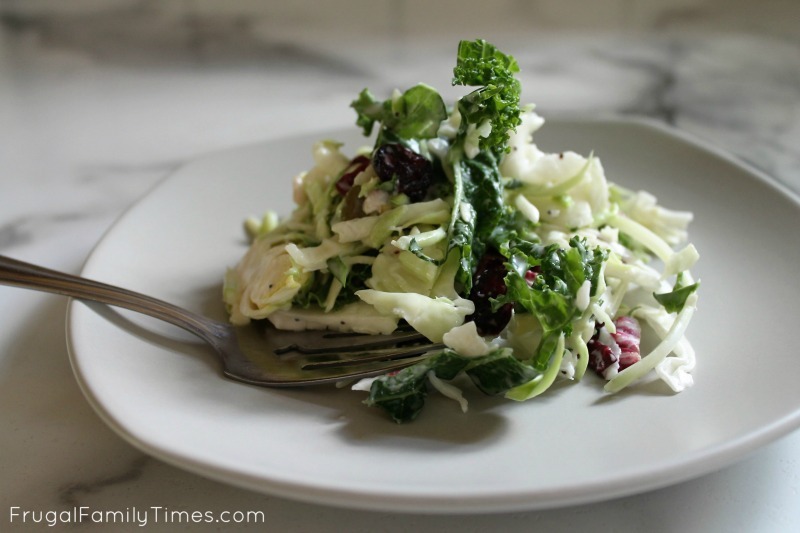 Who knew sliced Brussels sprouts could be an awesome salad ingredient? 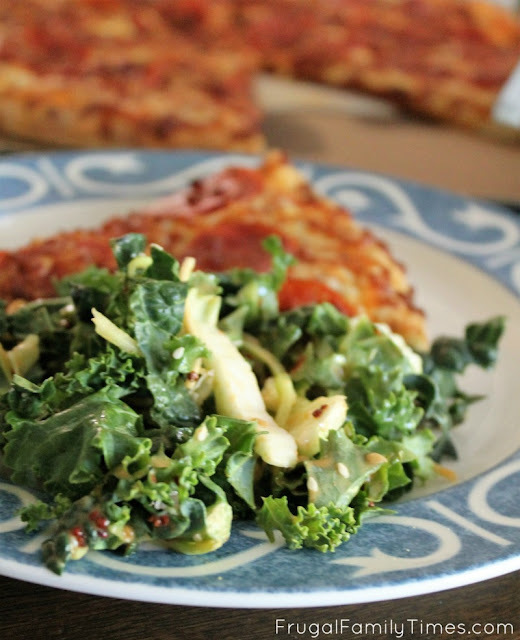 We elevated our take out pizza meal with the Sweet Kale salad. You probably know Ed and I are usually knee deep in a DIY project together. One of the ways we do it all - without fighting much - is having a simple and delicious plan for meals! There are other times in life when we need speedy, healthy meals, too. 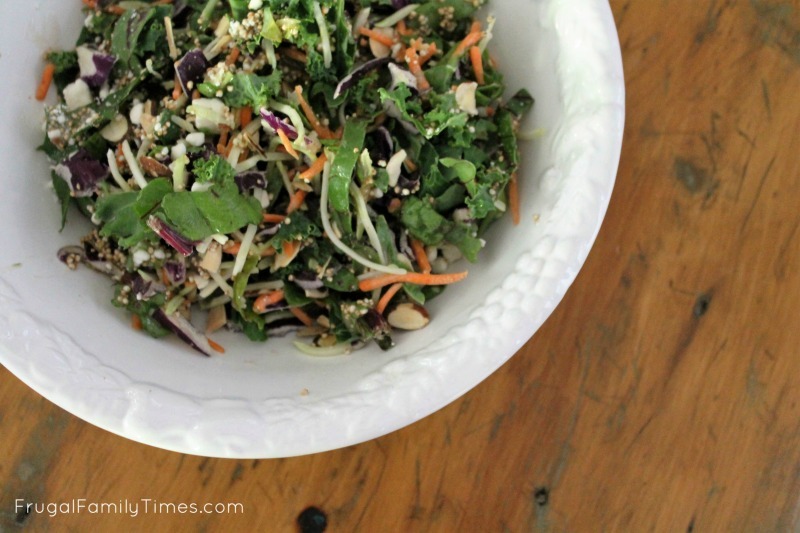 Have you ever timed the preparation of making a really good salad from scratch? Even a simple garden salad features lots of washing, drying, peeling and chopping. If you make your own dressing, that adds up too. Eat Smart has a way bigger variety of ingredients than we would ever prepare ourselves and all of their Premium Salad kits and Shake-Ups are pre-washed, chopped and ready to go. Salad kits like Eat Smart's are packaged well to stay fresh. They keep longer than any head of lettuce we've ever bought. So if you're life is hectic or you can't get to the grocery store often - you can still have a fresh delicious salad. Keep the bag sealed and you've got a couple weeks vs just days until you can tear it open and enjoy. Are there times you like to use salad kits? Did we miss any on our list? This post was sponsored by Eat Smart as part of an Influencer Activation for Influence Central and all opinions expressed in my post are our own. Number 4!! Yes! I'm excited to try some new mixes! These look so good. Yeah #4 is huge for us, Ashley! Anything that expands our kids palates is an ENORMOUS win! We enjoyed all 6 of these Eat Smart salad kits - you can't go wrong! Really great ideas! I don't think I have a favourite. 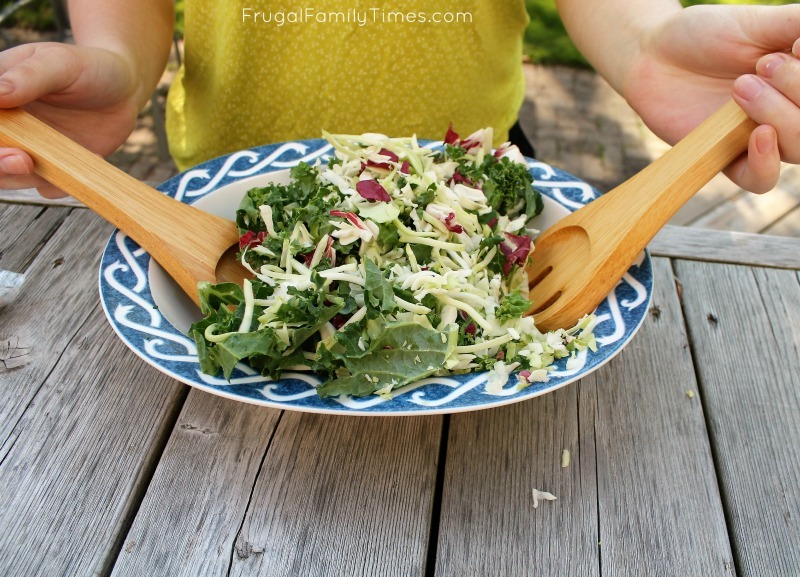 I Loooove those Kale Sunflower salads (is that the one that has shredded Brussels sprouts in it, too?) - I would waste so many veggies if I made the salad from scratch, so I don't feel guilty about buying the kit (which is totally unlike me, I am so cheap about EVERYTHING). We've been eating it for our Whole 30 challenge by using a homemade sugar free dressing and adding chopped boiled eggs. Complete meal, so delicious, and so convenient!! I'm right there with you, Jenn! I'm bargain shopper all the way with a few exceptions. This is one! Oh girlfriend, you are speaking my language...over the years I've figured out that I needed to put away my snobbish 'Oh, I only make my salads from scratch' thinking and figure out the big picture which is..I need to get the fresh veggies no matter what form they come in!! I love their cranberry kale salad...delish. I love having these on hand for the week. Mix it up with a protein and what an easy summer dinner.